Finally they are on sale again today and tomorrow. I thought about getting them yesterday and spending the extra money for 20x the points but decided it wasn’t worth it, as it was I had to go to two different Shoppers to get the 3 packs I needed. So I might of just been buying stuff yesterday just to get my $50 – seems kind of pointless to me. I did pretty well today I think. I also picked up some Marcelle BB Cream. I really love the one they sent me for free from their Facebook page so I decided to take advantage of the sale and my coupon. Pretty sure this is a product I will be using daily for a while. It is really nice. My Alberto coupons from Windfall Wednesday expire next week so thought I would take advantage of the clearance price on the hair wax. Pretty sure I did enough shopping this weekend to last me the rest of the week. I am shopped out! 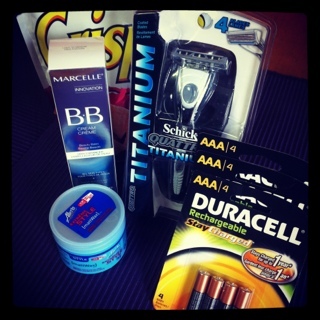 This entry was posted in canadian coupons, clearance, shoppers drug mart and tagged canadian coupons, clearance, shoppers drug mart on February 26, 2012 by Courtnie.